October 24, 1949: the laying of the United Nations cornerstone at its permanent headquarters in New York brings spectacle and a crowd of 16,000 to Tudor City's doorstep. The date is the fourth anniversary of the founding of the U.N. 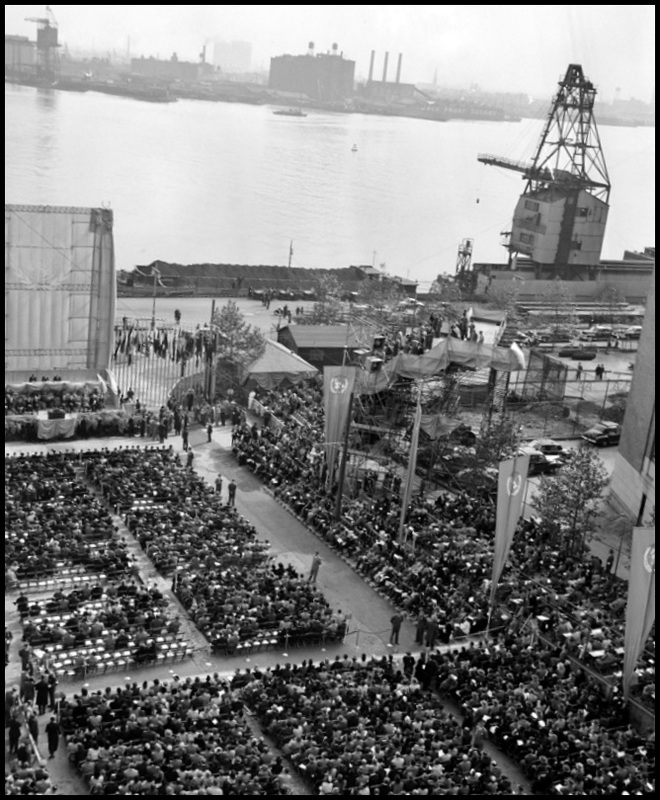 The ceremony is held in an outdoor amphitheater on 42nd St. between 1st Ave. and the FDR Drive. 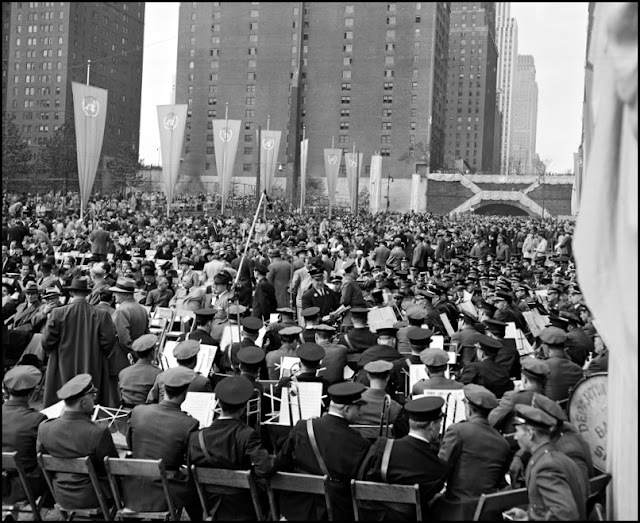 VIPs in attendance include Harry Truman, President of the United States, Trygve Lie, Secretary General of the U.N, Thomas Dewey, Governor of New York, William O'Dwyer, Mayor of New York, Eleanor Roosevelt, appointee to the U.S. delegation to the U.N, and John D. Rockefeller Jr., donor of the site. Giving the principal address, Truman says the cornerstone represents an "act of faith ‒ our unshakable faith that the United Nations will succeed in accomplishing the great tasks for which it was created." He calls the complex the "center of man's hope for peace. . . and a better life." Looking west down 42nd St., with the Chrysler Building in the background, along with No. 45, upper right. 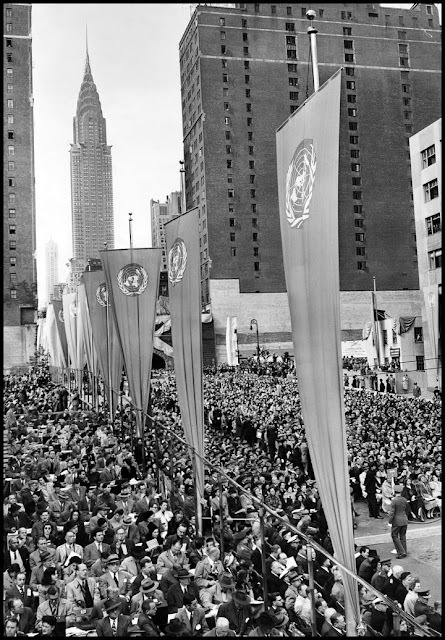 Blue U.N. banners lend a ceremonial note. The band, the audience, and the eastern walls of No. 5 and No. 25. 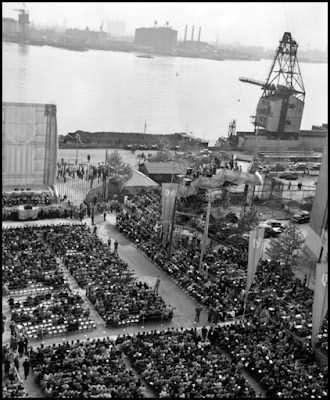 The Tudor City Tunnel, center right, is festooned in bunting for the occasion. Above and below, views from the opposite direction, looking east down 42nd St. toward the river and the speaker's stand. 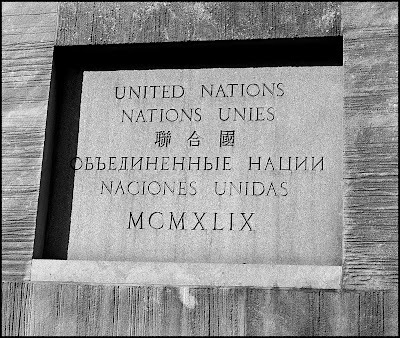 The cornerstone reads "United Nations" in the five official languages of the U.N. ‒ English, French, Chinese, Russian and Spanish ‒ and is dated 1949. Future construction obscures the cornerstone from public view. Today, the U.N. website reports its location as "underground, east of the Library Building on the southern boundary of the United Nations site." See a video of the cornerstone laying ceremony here.